Once there were two beautiful lands and two proud peoples separated by great distance and many differences. This is the story of how a wonderful friendship has blossomed between them... So begins the story of a most unlikely friendship. In 1959 the prefecture of Yamanashi, Japan, was devastated by two typhoons. Richard Thomas, an Iowan who had served in the U.S. military in Japan after World War II, helped organize an "Iowa Hog Lift" that sent 35 pigs flying across the ocean to Yamanashi. That act of generosity laid the foundation for the first sister-state relationship between the United States and Japan. As a freelance writer for nearly 20 years, I have written many times about Iowa and its people, but Sweet Corn & Sushi has been a uniquely rewarding project. The idea for the book came when I visited Yamanashi in 1999 as part of a delegation organized by Iowa Sister States. While there I heard the intriguing story of the Iowa Hog Lift. I was immediately struck by the whimsy and power of the story. Former Iowa First Lady Christie Vilsack's decision in 2004 to make the book part of her "Iowa Stories" literacy program was tremendously exciting. 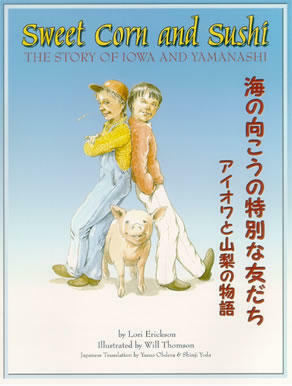 Thanks to her efforts, the story of the unique friendship between Iowa and Yamanashi reached far more people than I had ever dreamed possible, including 40,000 schoolchildren across Iowa who were given the book and many others in Japan. There's an expression that says, "When pigs fly..." (meaning that it's very unlikely that something will happen). In 1960, something unlikely did happen: a friendship was formed between two very different lands. I am happy to celebrate that friendship in Sweet Corn & Sushi. Hardcover copies of Sweet Corn and Sushi can be ordered for $10 at erickson.lori@gmail.com.